I was at the school that day and remember that we all thought it was a drill until we saw the flames. We all thought it was very exciting before finding out about the fireman who died. From memory there was always paranormal happenings there especially in the DS rooms. I seem to remember hearing that there was a manor house sited there many years ago which went up in flames and a woman died in the fire but how true that is, I don't know. I was at the school when the fire happened. Nowell house lower school. Remember it well. We all got sent home that day and had the next day off. Very sad news about the firefighter. My name was Linda Willing then. Hi, my name's Iain and I've just joined this site and found the comments about the fire at Upbury Manor. I was actually in the school that day and remember it quite well, yes I do believe that it was a bunsen burner that started it. Remember being in class ( Queens group)when the fire alarms went off and the teacher saying they weren't expecting a 'drill' so had better evacuate. Think a lot of people were laughing & cheering at the school being on fire but it was not until the next day we learnt that one firefighter had lost his life and another was critically injured, something we would not find so funny these days. I went to Upbury Manor as well although some 6 years before the fire. My girlfriend at the time of the fire went there, and my friend who sat next to me in class in Form 1A2, joined the Brigade and took Fireman McCulloch's place permanently on Red Watch at Medway Fire station. He lives just along the road from me. Although the press said that he was married, I'm sure that is incorrect, as I worked with his fiancee, Barbara during my Housing days,(see my posting 6/10/09) and she told me that they were making plans to get married when he died. 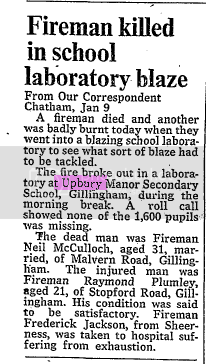 At around 11.00am on 9th January 1973, Red Watch were called to a fire at Upbury Manor School in Marlborough Road Gillingham. Medway's Water Tender Ladder and Gillingham Retained's Water Tender were first on the scene and found that the 1600-odd pupils were on their mid-morning break, so the school was empty. There was thick black smoke coming from the Science lab and a BA crew (Firemen McCulloch and Plumbley) were ordered into the building to ascertain the extent of the damage and to search for the seat of the fire. They entered the lab that was full of thick, acrid black smoke and began a search, when a ?flashover or backdraft? happened. A sheet of flame shot through the lab, separating them from each other. Fireman Plumbley had been thrown backwards in the direction of the door by the force of the explosion and despite his injuries, he was able to get back to the door where he was pulled to safety by his colleagues. Unfortunately, there was no sign of Fireman McCulloch so a 2nd BA team (Firemen Jackson and Murray) were immediately ordered in to search for him. Eventually, he was found, slumped against a wall with his BA mask off. Fireman Jackson was able to pull Fireman McCulloch from the blazing lab, but suffered burns to his hands neck and face in the process. All three were rushed to hospital but sadly Fireman McCulloch was dead on arrival. Six Pumps, the Emergency Tender and the Control Unit were called to the fire which was finally subdued, but not before the inferno had caused severe damage to the science lab and part of the new school wing. At the resulting inquest, the pathologist concluded that Fireman McCulloch had died as a result of Carbon Monoxide poisoning. Evidence at the moment of the 'flashover' showed that everything in lab would have been affected by the conditions in there; flames and the intense heat. This would have included fluorescent light fittings of the 8 ft type fitted with plastic diffusers and these were known to soften and burn, during experiments, when exposed to fire. One of these was immediately above the spot where Fireman McCulloch was found and from the evidence it seemed that one of these, in a state of disintegration from the fire, had fallen onto Fireman McCulloch's BA face mask which moulded itself around it as well as the set's harness. It was thought that Fireman McCulloch had removed his face mask as a matter of instinct to prevent himself being burnt. As a result of this, he was exposed to lethal levels of concentrated Carbon Monoxide. This incident brought to light a hazard not encountered before, and with the extensive use of these fittings, it was a matter that had to be given serious thought by the Fire Service in future situations. Fireman McCulloch was given a full Brigade Funeral with Honours at Medway Crematorium , exactly a week after his death. His coffin was carried on Medway's Turntable Ladder draped with the Union Jack Flag, together with his helmet and axe, and a large crowd had gathered at Medway Fire Station to pay their respects to a brave man. Members of his Watch rode with his coffin as Guard of Honour, preceded by the Chief Officer, Mr Babington and many High Ranking Officers from the Brigade. A large number of firemen from Brigades across the country, lined the road in the Crematorium. This was the most tragic of numerous fires in schools in 1973/4, many of them, apparently started deliberately. Source: Fifty Vigilant Years. A History of Kent Fire Brigade. i knew a few of the kids who were in the room at the time, as far as i can remember it was a bunsen burner which caused the fire, it was left on near the centre of the room, the bell had rung, and everyone was on the way out for the next lesson, so there was no one in the room the time it took hold, it was only noticed after the break, when people started to go back to their lessons, and was noticed by the teacher who saw the smoke as she entered the room. to the best of my knowledge, if this was the same fire as there were a couple started deliberatly after i had left in 71. I've recently been told it was in the area of what is now Room 212 that the Fireman died. Some of the inner walls have been moved about in that part of the school,also the stairs that were known as "The Scissor Stairs" have gone. I think the Science Department is one of the few departments in the School that is still in the same area as it was several decades ago,as most of the other departments have moved about the school numerous times. There's also been new bits added on to the school and new buildings. Interesting if anyone else remembers this..
i was reading on rossfamily history about a fire at upbury manor school. a fire fighter was killed in a backdraft in the science lab. his name was neil mcculloch, (wonder if he was any relation to the gillingham lad who was awarded the vc in the war??) he was stationed at medway fire station, where he is on the roll of honour there. was just wondering if anyone else knew anything else on this sad unofortunate loss of life.